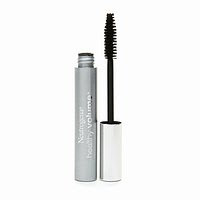 So, my new mascara is Neutrogena Healthy Volume mascara in black brown. I love this mascara more than LashBlast, and it is about the same price. The mascara contains olive oil that penetrates your lashes to make them thick inside and out. Sounds wonderful, right? My lashes were nowhere near clumpy, and they looked thick. This mascara is extremely easy to apply. I love this brush more than others, because it is very thick. If you get a little smudge on the top of your eyelids, it wiped off my skin with a lick of my finger. Wow! No complaints here! Don't forget about the amazing contest we have going! Win a FREE beauty product! There is more information at the side of the page. This mascara sounded good! I just saw it in a magazine add and just reading about it makes me wanna try it! I love this mascara too! We seem to love it for all the same reasons. I really love the soft but bold look it gives. It does give you a great look for your eyes!